Twenty one years after her memorable hit with her rock ballad Total Eclipse of the Heart, Bonnie Tyler is storming up the charts again - but this time in France. After much persuasion the 50-year-old Swansea-born singer has released a bilingual version of the 1983 global hit - dueting with young French singer/actress Kareen Antonn. Their record Si Demain (Turn Around) is No 5 in France after her record company responded to public demand and released the disc early three weeks ago. Tyler, who was at the height of her popularity in the 1970s and 80s with rock classics like It's a Heartache, Lost in France, Faster Than The Speed Of Night and Holding Out For A Hero, says she is surprised by her newfound success. "It's amazing," she told BBC News Online. "It was released three weeks earlier than planned after people heard it on the radio and went into the shops trying to buy it. "It went in the charts at number 26, then 19, and now number 5 - who knows where it'll be next?" said Tyler. The singer is a long-time friend of Swansea's other internationally famous daughter Catherine Zeta Jones and even sang at the Hollywood's star wedding to Michael Douglas. 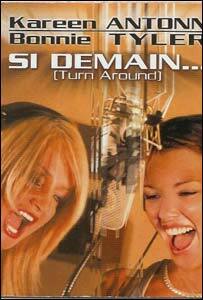 Now she is back home at Skewen after spending 12 days doing the rounds of French TV chat shows to promote the single. "I only speak 'pidgin French' but that doesn't matter," she said. "There's such a young, lively music scene there and everyone speaks English anyway." She said she had not wanted to re-record Jim Steinman's Total Eclipse - which was UK number one for three weeks in 1983, No 4 in the US charts and received two Grammy nominations. The ballad was covered by singer Nikki French 10 years ago, and more recently was a dance track hit for Jan Wayne. "Total Eclipse was such a special song and I did not think it could be a duet," said Tyler. But it was after hearing a version that Antonn recorded on her own that Tyler was convinced it could be done well. The pair got together in France and found they were compatible, recording the song in just a couple of hours. Then they went to Canada to record the video, which just like the 1983 version, was filmed in the snow. Now Tyler's trying to get on with more tracks for a new album which is being requested by her French record company in the wake of this latest single success. She says she has already written some original tracks for the new album - her 19th - but before that at the beginning of February she has another trip to her France and Mauritius to promote her duet. "I did not expect getting this. I just enjoy the journey," said Tyler.